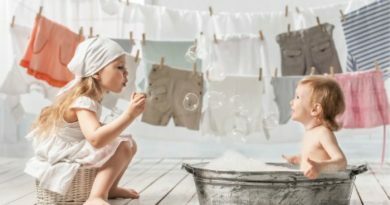 Here’s the deal, everytime we walk into our laundry room and throw a batch of clothes in the electric washing machine, and then throw them in the dryer, life is good. We have fresh clean clothes within a few hours. 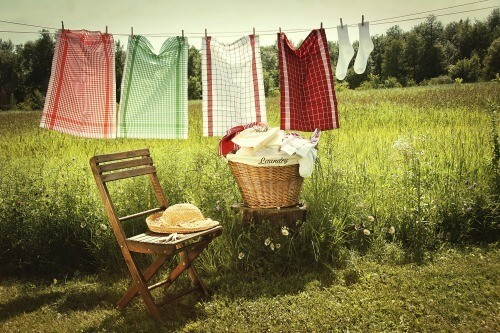 I remember as a young girl hanging up our bed sheets on a clothesline outside and watching them blow in the wind. We had a bag that held the clothespins and a rather large laundry basket to carry the wet clothes outside. We never used fabric softener, although the towels could have used it because they felt so rough and stiff. 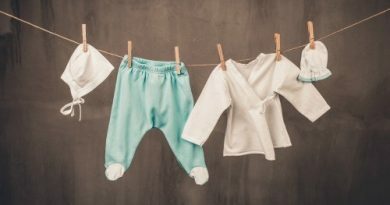 I want to put all of my emergency laundry ideas into one post for my readers to see some options they may be able to use. These are fairly cheap and you can find them at most hardware stores. The washboard I found at a thrift / antique store. 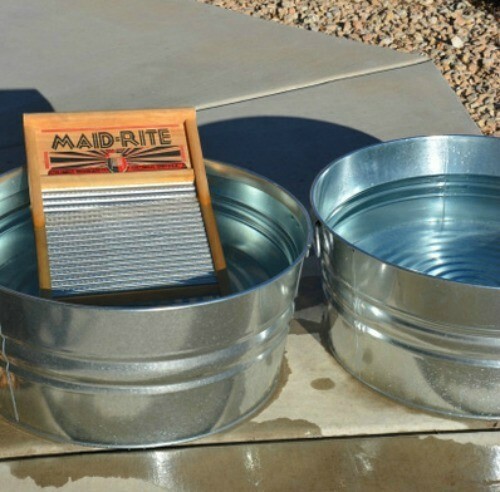 I bought the brand Behrens Wash Tubs and they sell a Washboard as well. I made a portable washing machine with two-5-gallon buckets and drilled holes in the inside bucket. 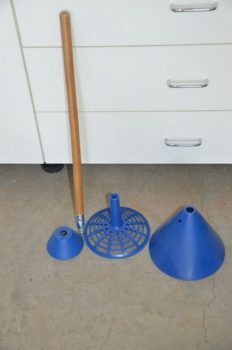 I purchased a Mobile Washer and made two complete sets. One for washing and one for rinsing. You use very little detergent and you can wash a few items fairly well. I gave a neighbor down the street a set and she uses her laundry buckets for underwear between laundry days. I love it! 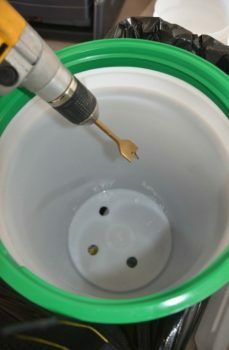 The picture above shows how Mark drilled two-inch holes in the green Gamma lids. We drilled one-inch holes inside the inner bucket to give a little friction when washing. Easy peasy. This is the Mobile Washer, the new ones have a nicer handle, but this one still works great. This is the Amish wooden clothes rack from Lehman’s, the store I want to visit someday. It’s on my bucket list. 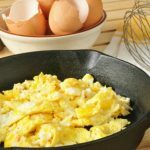 Put these 3 ingredients in a blender to blend and grate the Fels-Naptha even more. After doing this it will look just like the store purchased detergent but will not include all the “fillers”. You will use less product per load and will have less “bubbles”. Remember, just having bubbles doesn’t mean clean. I use 1 tablespoon per load. I have an HE-High Efficiency washer and it works great! 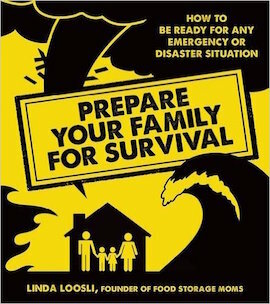 Let me know what you are going to use to have clean laundry after a disaster or an unforeseen emergency. I love having clean sheets as well. I could easily do my sheets separately one piece at a time in either one of these wash tubs or buckets. I want to save my money and buy a wringer, or maybe I will be lucky and find one at a thrift store or antique shop. I love Lehman’s. If I had unlimited money (which I don’t), I would spend a big chunk of it at Lehman’s. I love looking at the wood cooking stoves. It makes me remember going to cabins in Canada in my youth. They have people working there, that really understand oil lamps. Yeah!!! The crock section is really good also. If you make it to Lehman’s send me an email, and we will try and meet you there. Would be handy for laundry… on wheels too! I’ve visited Lehman’s in Kidron, Ohio numerous times. My husband is very indulgent about what I want to buy but I will admit, their shipping costs are high if you don’t take your items home with you. A couple times a year, they have smaller, flat rate shipping (Usually around Mr. Lehman’s birthday) and some free shipping. 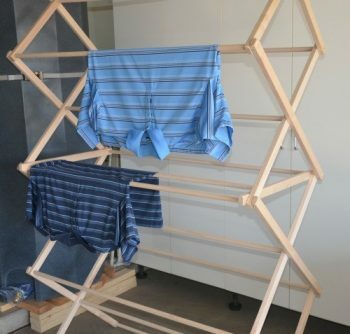 If you buy items like that heavy duty drying rack (I have 3), there are surcharges. It takes hours to go through that store because it meanders all over, having been built on several times. Plan on spending alot of time there! she hand makes the hangers too. Having just returned from Lancaster County, PA a few days ago, I saw alot of clothes on lines. 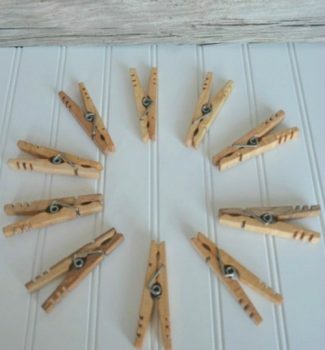 One item I purchased there many years ago was a clothespin wheel – it’s an old bicycle wheel with all the spokes removed. You drill a hole in one end of the clothespin and tie it loosely to each spoke hole. Then it’s hung from chain and can be hung on your clothesline. It’s great for socks, undies, small items, etc. I’ve used mine for years and wish I had bought another one. An interesting fact; Ohio Amish have bicycles, but Pennsylvania Amish aren’t allowed them – they use retrofitted scooters made from bikes. Interesting. One item I want is a wringer, which Lehman’s sells but they’re expensive. Just about everything one might want for “non electric” needs can be found at Lehman’s. Another idea would be a restaurant supply store. I’ve found alot of cleaning supplies and large cooking items there and they’re open to the general public. Oh, I’m so glad you like them as much as I do! I’ve had mine up for over a year and a half and it’s still holding up really well. I love the denim type fabric. I do bring it in in the snow and rain but it still bakes in the sun alot during the summer. No. Nevada isn’t as harsh sun-wise as So. Nevada is tho. I bought extras too, so I could have backups. You never know how long someone will stay in business. Nope…you didn’t get it, it got returned. Is there a way I can send you a direct email? Thanks one more time for another great post. 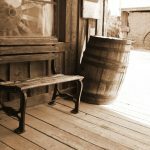 I don’t think I’ll mind the wash, rinse and hang to dry, but I’m sure dreading having to pump water our of the well by hand. Linda you may not be washing jeans, but I sure wont be using the sad iron. Just a side thought, use a little white vinegar in your rinse, it will disinfect, protect your machine and soften some also. Can remember Mom and her old cast iron wash kettle, over an open fire. So grateful for progress! I made a clothespin holder out of a gallon plastic milk jug. Cut through the base of the handle, to separate it from the jug itself. opposite the handle, cut an opening (below the ‘top’), big enough to put the clothespins in and get your hand in to get the pins out. I also made a couple holes in the bottom, to drain water out, in case it rains while the jug is on the line. (The opening at the handle base is to hang the jug on the clothesline). Cheap! Just make another if this one wears out. Good luck! Love your posts!! think a hand crank washing machine would work well. could even pair it up with a small 12V motor if you have solar or adapt an old bike to turn it. My mom took a little girl’s dress sewed up the bottom put a hanger in the top and used it for clothespins. 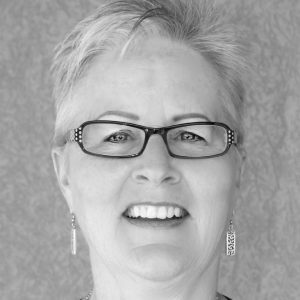 It slid on the clothesline and was brought in when the clothes were..
Hi there Linda ~ I bought the Novaplus 500 Umbrella Clothesline Dryer at Amazon about 6 months ago and I love it. It’s very easy to set up; instructions were in German, but it’s a common sense, look at the picture sort of thing. There’s really not a lot to put together. The downside is that I paid about $170 and I see it’s going for $235 now. Love your blog, you are so kind to share so many ideas and hints with everyone. 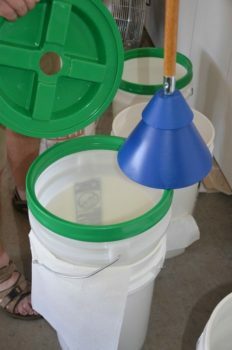 Living in Puerto Rico I’m without power right now so I have the 5 gallon bucket “washing system” and it works great except for the wringing part. To wash the linen I used a hardy plastic toy bucket. It’s larger and ideal in size. Instead of using the mobile washer I climbed inside the bucket and washed the linen as if I was pressing grapes. The linen came out clean and the workout was good and fun. We always had the homemade pin bags when I was a girl. We kept it on a nail on the back porch. 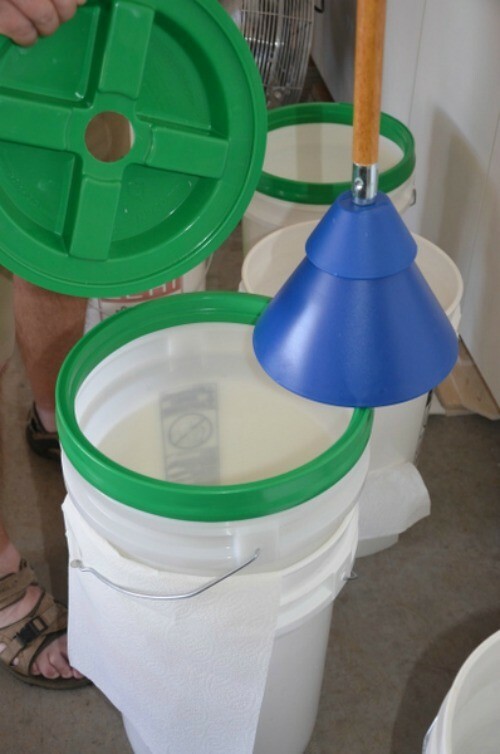 I have used 2 gallon buckets for years. I just set it on the ground. When I take the last load off the line, I take the bucket with all the pins inside and put it beside the washer. I like the vinyl coated twisted wire lines. However, they are VERY hard to find. They used to make the best ones here, in the USA. The imports are very inferior. (Same goes for the imported pins) I had one line to break a couple of weeks ago as I was hanging laundry. All 3 of mine are stretched between trees. I have tried the mop bucket wringer and while it gets water out of clothes, it doesn’t do it all that well. Save your money and get a dedicated wringer instead. To get water out of jeans (or other large, bulky items), secure a closet rod pole in brackets a few inches from the wall. Straddle the p0le with each pant leg, then hold legs together at the bottom and twist. They will be wrinkly, but pretty dry. If you dry them while the wind is blowing pretty well, the wind will work most if not all of the wrinkles out. Obviously, you could do with with an existing pole-like apparatus, either horizontally or vertically (do you have a flagpole or a sturdy deck railing?). This is the way I used to help my Nana with her laundry. We would twist all of her sheets and pants (few of those) before hanging them on the line. We each would take an end and start twisting. She was much stronger then me. The wrinkles came out in the wind. Ikea has a wonderful drying rack that’s only $15. It’s named “Frost”. We have two, we dry all our laundry outside (except sheets during allergy season). If we have a lot of rain we just set the racks up indoors. I don’t understand wishing for expensive things. Everyone posting here is groaning about the cost of things. The wringer from Lehmans is under $200. I don’t consider that expensive. I bought it, and I put it on my charge card. It’s paid for now. I also bought 2 small cast iron wood stoves on ebay for $188 each–with my credit card. They are now paid for. I bought a really big nice, red Italian wood cook stove for $2,600 and put it on my PayPal credit account, where I get 6 months with no interest. Still paying. I don’t wait for wishes to come true. I have bought every thing I need and put it on credit cards for the last 16 years. If the TEOTWAWKI comes before I pay them off, then I won’t have to pay on them anymore. If it doesn’t, I will gladly make the payments until they are done. 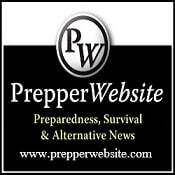 I remember one PA book I read where the man was a prepper and when the EMP came, he lamented that he had not bought that $1200 solar freezer he wanted. I’m not going to be sitting there wishing. I am going to be laughing that I don’t have to make the credit card payments anymore. I am retired, live on a pension and Social Security so I am not rich. I just don’t spend anything on myself, drive a 12 year old car, and prefer reading, working on genealogy, and spending time with my grandchildren over traveling the world or owning a beach house. So my money goes a long way. No, I have not tried the Lehman’s wringer. It is put away with my other preps for the end times. Thanks for your review and positive comments on the Ball Clothes Washer by the Breathing Mobile Washer LLC. It’s nice to read reviews and see pictures and videos of satisfied customers. We sell to Lehman’s which has been a great customer for many years. We’d love to see more pictures and videos of our product being used. Thanks for helping to get the word out on the Ball Clothes Washer. We do have new handle selections, a compact 2 piece version and a T-shaped ergonomic extension. 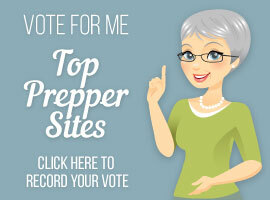 Sign me up to the Food Storage Moms newsletter! 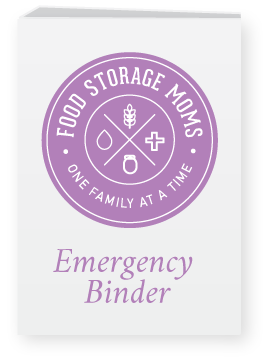 Download my FREE Emergency Binder. Food Storage Moms is a participant in the Amazon Services LLC Associates Program, an affiliate advertising program designed to provide a means for sites to earn advertising fees by advertising and linking to Amazon.com. View our full privacy terms and disclosures here. Copyright © 2019 Food Storage Moms. All rights reserved.